Radar Online reports that the 80 year old comedienne and E! Fashion Police presenter branded Kim K and Kanye West's seven months old baby, North West, 'ugly' and 'desperately in need of a waxing'. 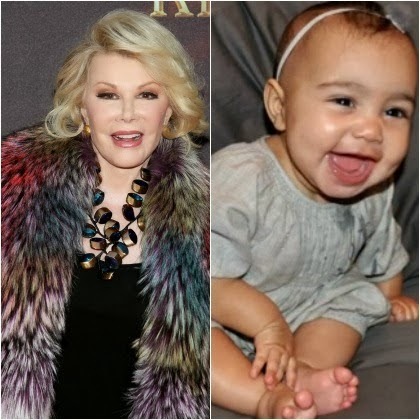 The comedienne joked about North as part of her latest stand-up comedy routine. She explained how she had met baby Nori when Kim brought her into the offices of the E! television network. 'That baby is ugly... I've never seen a six-month-old so desperately in need of a waxing.' Joan told her audience at Saban Theater on January 17 in Los Angeles.